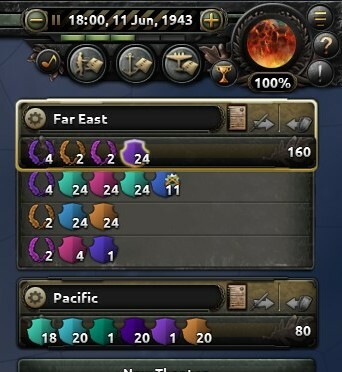 I definitely would not keep 24 tank divisions in one province for a couple reasons. For starters, you’ll want to attack from multiple directions at once, just for combat width reasons alone. 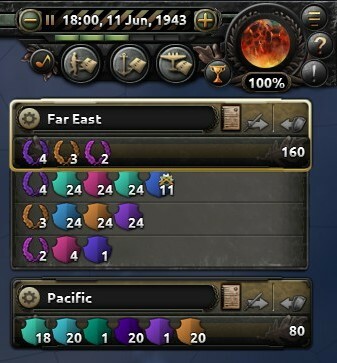 24 divisions won’t be able to fight all at once, but if you attack from multiple provinces you’ll increase your combat width so more tanks can bring their guns to bear. The second is I would worry about supply consumption. Tanks tend to be pretty supply heavy so I would worry my logistics wouldn’t be able to keep up with that many tanks in one spot. A lot of that depends on what exactly your tank division is comprised of, though. From your screenshot it doesn’t look like they’re running into supply issues right now (although you have a critical supply shortage up in Scandinavia somewhere!). I have critical supply shortage in Scandinavia? How can you tell? I must be ignoring some kind of warning? Also thanks for telling me about tank attacks. I would have never figured out that I should not do what I’m doing. No wonder they’ve been TOTALLY useless!!! A backpack looking icon would you let you know you have a supply shortage. A backpack on fire like in that screenshot means the supply situation is pretty critical up there! Clicking on it should zoom you to the problem spot and you can look at the Supply map mode to see where the bottlenecks are. Tanks are you attackers/exploiter. Infantry are your defenders. Unless you were planning an offensive, tanks should have been in the rear to cut off any penetrations. They started that way then I got impatient and started trying to plow them into some of the German wedges. Didn’t work lol. This is a little misleading. Having 24 divisions in a province probably won’t give you this stacking penalty. If it did, the penalty would be something atrocious and well over -100%. If your division widths are all 10, 20, or 40, you won’t hit any stacking penalty for having 24 divisions in combat. The ones over 80 width simply sit in reserve, waiting for width to open up. Where you do run into this issue is when you have divisions of different widths and/or ones that are not divisible by 10, 20, or 40. Let’s say I have two divisions of size 20 and 3 of size 16 and I attack from a single province. An attack from a single province gets 80 width. 40 of this is used by the two size 20 divisions, and 32 is used by 2 size 16 divisions. That’s 72 of 80. I have 8 left and a division to spare, so the combat algorithm will put the 3rd size 16 division in there. Cool, but now I’m overstacked (88 of 80) and receive the above penalty, which in this case is 8*2, or 16% reduced effectiveness to all of my divisions participating in the combat. I won’t say putting 24 divisions in a single province is a good idea, but it doesn’t necessarily carry the steep penalty above. As the Soviet Union should I have to build synthetic refineries? It feels like I’m missing some way of drilling for oil and moving that into fuel production. I’m not sure how much oil I’m even harvesting? I don’t know that scenario yet. But you seem fine, with plenty on storage and currently stockpiling the rest (for 61 days to reach the maximum, though it’ll vary). Hover over the fuel storage and it’ll tell you a lot of numbers about extraction and usage. It’s nearly 42 and they’re barely into Russia, soon the allies should start regular invasions in France and Italy to alleviate some pressure, even with the current buffed up Axis AI. What is the difference to divisions being on the top vs. bottom line? That view says the same thing as the view on the bottom (but always visible), it shows the army groups they’re in (or none). Try to have them always in an army group with a field marshal, even if they’re doing different things - it’s still a few more bonuses, and their location doesn’t matter (except when creating an army group front, but you can always modify it). You created lots of theaters and didn’t put armies in army groups. The top row now has the army I split off displayed in it. If you add armies to more army groups, your theater view will make more sense. Your theater has one field marshal with one army in it, and the rest aren’t in army groups. Most field marshals can command 5 armies. Wow that’s a big revelation. Thanks for pointing that out. I’ll fix that. If I don’t set a garrison option for infantry, will they still get entrenchment if they sit there long enough? Yes, they’ll entrench whenever they’re not moving. Yep! And as Perky pointed out, you get stats, too. Attack, defense, planning speed, supply reduction, and others depending on your field marshal’s traits. Even a skill 1 FM is better than nothing. I have to say, @jpinard, it’s pretty impressive what you’re doing with the Soviets in your first stab at the game. The USSR is huge and a lot to manage, plus you have the Germans knocking on your door to deal with. You definitely jumped into the deep end of the pool! As Russia I don’t have any good Field Marshals because of the purge. Would it be worth it to me to promote one of my top Generals (Ivan Konev) so I get more bonus? I need lots of defense cause of Germany, so in the grand scheme, I’m not sure if he’s better as General or Field Marshal. Are you supposed to activate your “plan” when you’re guarding a front? No need to execute a plan while on defense. Field Marshals level quite slowly, so getting a really good General and then promoting them works well, especially if you went with purging the only good FM. The purge presents you with no good options. FMs have a different skill set than Generals, so keep that in mind when choosing traits. You can hold off on picking traits until you decide to promote them and then go with FM traits instead of General ones. Does building up infrastructure give you more resources? Watching a Youtube vid right now and he made that comment. In other news I lost my game again lol. I do not have good grasp on how I should be defending against the Axis.